When the tasks in an organization are repetitive, it is required to generate a set of Standard Operating Procedures (SOPs). These make the tasks in hand easier and effective, and save a great deal of time and efforts. The SOPs also help to avoid common errors. Check the linen. Replace if required. Confirm the type of dining (Formal/Informal). Service plate (dinner plate) one inch inside from the table edge. Salad plate on the top of the dinner plate. Forks on the left according to their size with the biggest fork being nearest to the dinner plate. Dinner spoon and knife on the right side of the dinner plate. Dessert spoon and fork on the top side of the plate horizontally. Bread plate (quarter plate) on the top-left corner of the dinner plate and a bread knife on top of it with its cutting edge pointing outwards. Water glass and wine glass on the top-right corner of the dinner plate. Neatly folded linen napkin on the extreme left just after the salad fork. Dinner plate one inch inside from the table edge. Forks on the left side according to their size with the biggest fork being nearest to the dinner plate. Water glass and wine glass on the top-right side of the dinner plate. Neatly folded linen napkin on the top of the dinner plate. Always attend the phone call instantly, preferably within three rings. Speak attentively with the caller. Avoid speaking with anyone else present around when the call is going on. Always inform the customer if the call needs to be transferred or if the customer needs to be put on hold. Always address men customers as “Sir” and women customers as “Madam”. Do not keep any doubts unresolved before finishing the conversation. Speak politely and clearly; not loudly. Avoid jargons and informal words such as “Yup”, “Huh-Huh”, or “ok.” Instead, use words such as “absolutely”, “certainly”, and other similar words. Always end the call saying, “Thank you for calling”. The orders for table reservation or food delivery can be taken on phone. Direct service orders are placed and taken at the guest table. The visual channel of communication is not available while taking orders on phone. So, the staff needs to pay complete attention to what the caller says while taking order on the phone. Listen attentively to the customer’s requirement of food, beverage, or table reservation. Note down order details on a notepad. Tell the customer about estimated time of delivery if it is home delivery service. If it is table reservation, confirm the timing, number of persons, and preferably the occasion. Repeat the order to the customer and take confirmation. Ask for the address or confirm the address and contact number if it is already in the database. Terminate the conversation by greeting the customer. Inform the kitchen staff and delivery staff member in case of home delivery. Inform the service staff to prepare a table for the given number of persons and the occasion in case of table reservation. This happens when the guests are already seated. Make sure the guests are seated comfortably. Show them welcome drink or chilled water. Note down the order carefully. Ask about which variant of the food or beverage they wish to have; if there are any for the same food item. Suggest the beverage or side dish that goes well with the main dish if required. Repeat the order to the guest with their respective quantities. Inform the guest about expected time of order arrival. Leave the guest table to transmit order to the kitchen. Keep upright posture and smile on the face while speaking to the guests. Let them know, as a service staff, you are eager to serve them. Be respectful to elderly guests, friendly with the same-age guests, and jovial with the children. Keep the voice of speech audible while talking. Apologize if some food item or beverage has run out of the stock. While the guests are having their meals, make a round to observe if everything is fine at the table. Dealing with the highly drunk gusts. Dealing with the guests with zero or partial eyesight or any other physical difficulty such as a fractured leg. Dealing with the guests who show difficulty in communicating. Dealing with active toddler guests. The service staff needs to be careful while carrying the trays in their hands and going around the dining area. They need to follow a decorum while carrying and loading the trays. Carry one tray at a time. Carry it on the left hand slightly above the shoulder. Hold it little away from the neck and mouth for the hygienic reasons. Do not overload the tray to avoid spilling. Keep the tray load always evenly distributed. Adjust the position of drinks or food briefly every time something is removed from it. The following are some meticulous ways while serving food or beverage. Bring the food to the guest table unless it is buffet service. Always present the food from the guest’s left side in case of formal dining. Prepare the food plates from the kitchen and place them on the guest table in case of casual dining. The guests then serve themselves. Serve one food item at a time. Serve the eldest lady guest of the group first unless the lady herself is a host. After all ladies are served, serve the men guests starting from the oldest. Always present a dish with its respective serving spoon. Lift the service platter up and take away after serving. Always present a drink in an appropriate glass with a straw. Plain straw is light so keep it out of the glass while serving. Designer straws are placed into the glass while serving. When same wine is offered in consecutive courses, serve it in the same wine glass. Else replace soiled glass with the fresh one. Always follow the right way of pouring aerated drinks or fuzzy drinks by tilting the glass and the bottles so that the drink head and aroma remains held. Do not bend over served plates while serving other plates across the table. Move as nearest as possible to the plate. Clear the table first time when the guests finish main course. Clear it for the second time just before the guests leave the table. 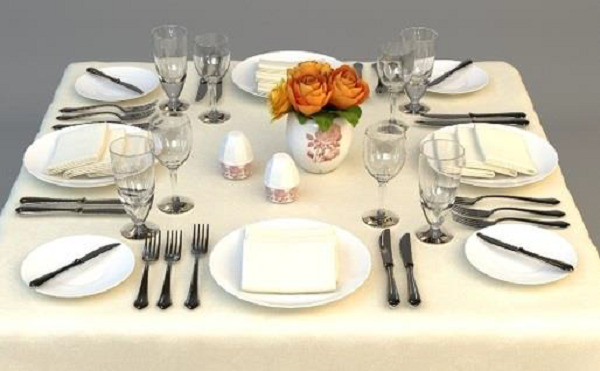 While clearing, remove used and unused pieces of flatware and chinaware except table linen and center piece. Let the dessert flatware remain if it is first clearing. Let the wine glasses remain even after the main course. When same wine is offered in consecutive courses, serve it in the same wine glass. Else replace soiled glass with the fresh one. While clearing, pickup one plate and place on the tray at a time. If it is a formal dining, slide a fresh plate in place of the removed plate so that the table cover of the guest is never empty. Do not overload the tray with pile of used plates. Make extra rounds to the table if needed. Before presenting the bill to the guest, make sure the guests don’t want to order anything more. There are many policies of setting guest bills in the F&B establishments. Some prefer the guests pay cash at the cash collection counter. In such case, the serving staff must accompany the guest to the payment counter to ensure only the right amount is charged to the guest. Once the guest confirms, ask for the mode of payment. It should be either credit card, debit card, or cash. Go to the payment counter to prepare the bill. Cashier prepares the bill according to the table number told by the waiter. Present the bill in a small closed folder to the guest from left side. Stand beside the guest patiently till the guest examines the bill. If the guest pays by cash, take it and deposit the amount at the payment counter. If the guest wishes to pay by card, take the guest’s signature on the bill, and take the card and bill to the payment counter. If the establishment has facility of mobile payment service, take the device to the customer. The cashier returns the balance amount if paid by cash. If the payment is by card, the cashier checks the expiry date on the card and accepts the payment. Bring back any change or card, and the copy of printed bill to the guest. 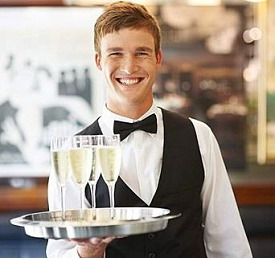 If the guest insists to take the tip, mention thankfulness with smile. When the guest stands up to leave, pull the chair backwards to help him get out of the chair gracefully. Thank the guest for the visit and invite to visit again.